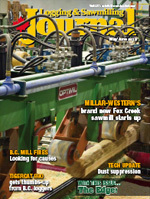 Stimson Lumber Company, like a lot of sawmills, has taken advantage of the slower economy to make upgrades to its mill operation. Using mostly hemlock, as well as Douglas fir and spruce, Stimson produces 8 and 9-foot 2 X 4s with a small percentage of 2 X 6s. To keep its customers happy—primarily the big box stores like Home Depot and Lowe’s—Stimson continually makes upgrades, like the recent $5.5 million replacement of the canter and upgrade to an optimized double length in-feed scanning system. 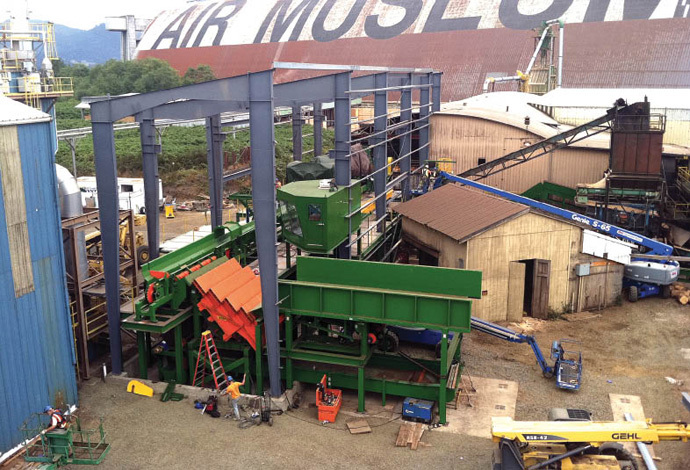 There’s no getting around shutting down when doing a major installation like this, but Stimson performed as much prep work as possible to minimize the production downtime. 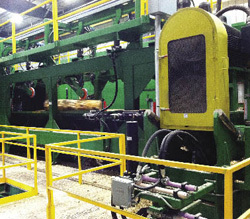 The mill built up an inventory of upwards of 6 million board feet of lumber so the planer could continue to run. Installation began in June, and they did everything from realigning other equipment, to building up inventory to construction of the building around the new canter. Stimson maintenance superintendant Mike Cates in conjunction with sawmill supervisor Jon Stevens took ownership as soon as equipment arrived. 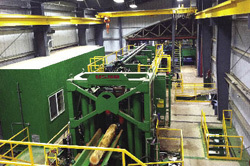 The primary purpose of the Stimson mill upgrade was fibre recovery—to produce the same volume, but use less logs. Stimson could justify the project with a seven per cent increase and to date they’ve seen closer to 10 per cent. Initially, the company anticipated the upgrade would pay for itself in less than two years and they now anticipate the payback period will be more like 18 months. At any given time during the upgrade, 20 to 25 extra people, unfamiliar with the mill, were on site and there was increased potential for accidents. To counter that, every person on the property was required to take a one-hour safety training course at Stimson, regardless of who they were employed by. The primary purpose of the upgrade was fibre-recovery—to produce the same volume, but use less logs. Stimson could justify the project with a seven per cent increase and to-date they’ve seen closer to 10 per cent. Initially, Stimson anticipated the upgrade would pay for itself in less than two years and Stirk says they anticipate it will be more like 18-months. “This project was part one of a three-phase project,” he says. “We were hesitant to do it all at once, just in case. But this project went so well that we’ve advanced our plans on Phase 2, a vertical twin band saw, as well as Phase 3 to replace our hand-fed edgers with optimized edgers. Taking on a big project always has its challenges, and being familiar with upgrades, Stimson worked to be prepared for the unexpected. The biggest concern, however, was taking care of their employees. Prior to the upgrade, the logs came in on the deck, went through a Nicholson debarker and then on to a chop saw. They would roll into a trough and into the canter. What has changed, says Stirk, is that they still go through the debarker and up through the chop saw. But now they go outside the building onto a long belt, into a surge bin transfer. The logs travel up and inside the building. Instead of randomly falling into a trough, they go through the scanner and then they are rotated and positioned, and sent through the new canter. The spot where the old canter used to be located is now waiting for the new twin saw and when that happens, routing will change. It will mean a bigger adjustment, but Stirk is looking forward to the addition of the twin saw, because it will mean an increase in volume as they will be able to get additional cuts off larger-diameter logs. West Coast Industrial Systems (WCIS) of Lebanon, Oregon, was the primary contractor for construction and installation on the Stimson project. As mentioned, USNR was a major equipment supplier. Linden Fabricating supplied the step feeder and log ladder. Key Knife supplied the canter heads and Western Integrated supplied the MCCs. Delta Fire did the fire system and APST was responsible for hydraulics piping installation. T&L did the electrical installation. Stirk says that an upgrade like this one helps the mill better contribute to the entire company. “We have seven manufacturing facilities right now; four in Oregon and three in Idaho. Five of those are stud mills and one is a hardboard plant and one cuts dimension timbers. We employ over 600 people, and 95 at this plant. More upgrades and expansions are in the works, in part because Stimson is optimistic about the future.